Brooches started with a very utilitarian purpose, and transitioned into being decorative. 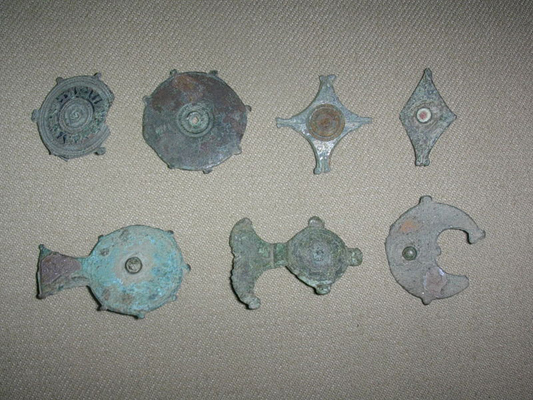 Early fibulae c. 10-8th century B.C. 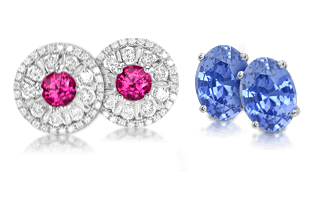 As vehicles for displaying gems, brooches offer particular advantages. Like earrings and necklaces, brooches can be worn near eye level for easy visibility. 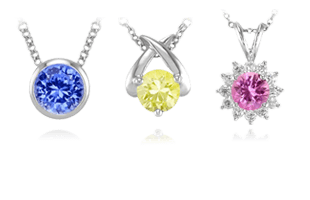 They are also one of the best ways to display very large gemstones. Clips, pins, and brooches were once far more common than they are today. Brooches are some of our oldest jewelry. When man began to fashion clothing for himself, he used pins of bone and flint to hold it together. Etruscan fibula decorated with granulation c. 7th century B.C. During the Bronze Age, these pins, known as fibula or fibulae (plural), were made of bronze and other metals. Early fibulae had three basic shapes: the “safety pin” form, the round disc or “annular” form, and the “penannular” form, which looked like a ring. As fibula styles changed quickly over time, they are quite useful for establishing the dates of archaeological finds. Illustration of a chiton, which is pinned at the shoulder. In ancient Greece, men and women wore a garment called a chiton. It usually consisted of a single rectangle of fabric that was fastened at the shoulder by a fibula. In the 1st century A.D. fibula designs were much more varied; however, the most common shapes were round, oval, crescent, and diamond shapes. The main article of clothing for a Roman woman was a stola or stoles (plural). These were usually comprised of two rectangular pieces of cloth, which were joined at the side by fibulae or brooches. Braganza Fibula/Brooch made of gold, c. 250-200 B.C. In ancient Rome, highly ornate fibulae made of precious metals were worn by the aristocracy, and simpler ones were worn by soldiers and commoners. The 1st century A.D. also saw the widespread use of plate fibulae, which were comprised of a flat plate without any arch. Because the plates were flat, they were probably not used to fasten bulky garments, but as ornaments. Archaeological data indicates that these ornamental brooches were worn primarily by women. Roman plate fibulae from the 1st century A.D. 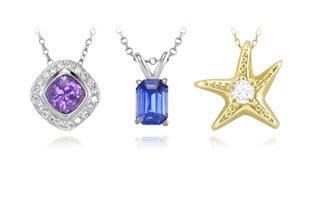 In the early Middle Ages men of the aristocracy were known to wear fabulous jewelry. Most commonly they were known to wear brooches to fasten their cloaks, but also buckles, purses, weapon fittings, and necklaces. Viking brooch of gilt copper c. 600 A.D. 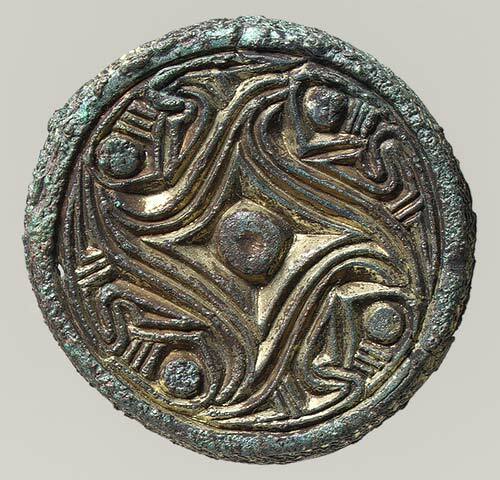 The Vikings created large brooches to hold heavy garments designed for the inclement weather that they dealt with at home and also on many of their lengthy voyages. Some of these are called tortoise brooches because of their unusual shape. 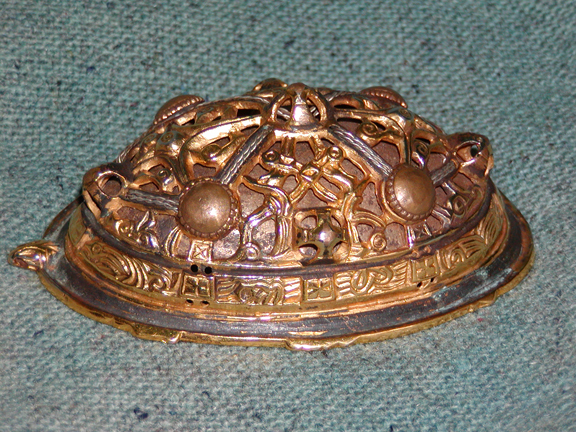 Viking “tortoise” brooch of gilt bronze. The Byzantines created elaborate brooches enhanced with gemstones and enamel. Early Christians adopted this style, but also included religious images, symbols, and inscriptions. It is apparent from the designs of brooches from this period that they were primarily ornamental rather than functional. 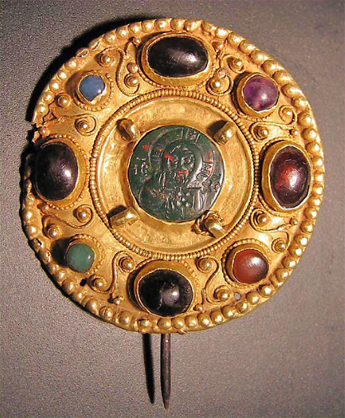 Early Christian brooch made of gold and set with gems. 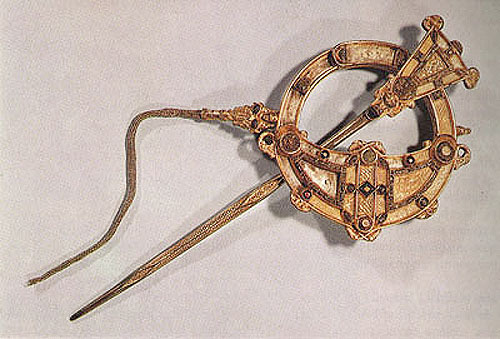 Between the 9th and the 13th centuries, the penannular brooch reached the height of its popularity in the British Isles. Penannular brooches were meant to be worn with the pin facing upwards. Once in place, the ring was twisted so that the pressure of the fabric helped to hold it in place. 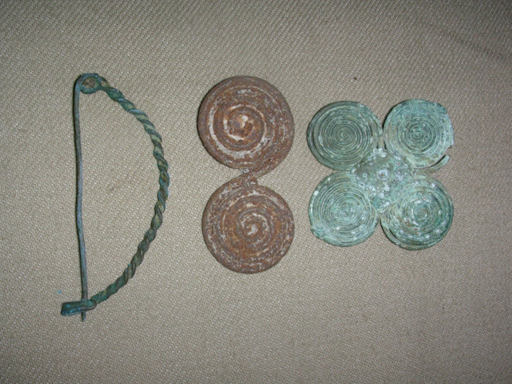 Several advanced techniques were made to construct the Tara Brooch, dated 700 A.D. It was fabricated from gold, silver, copper, amber, and glass with the use of enamel, filigree, wire-beading, granulation, inlay, and solder. By the 14th century, draped garments were replaced by true tailored fashions. Some styles included wearing small brooches all over the clothing, although the single large brooch, often set with precious gems, was still frequently used. Bejeweled livery badges, symbols of a particular office or person, were worn by acolytes and followers as a demonstration of their loyalty. In other circumstances, lords gave their servants lead or pewter brooches to sew onto their clothes. 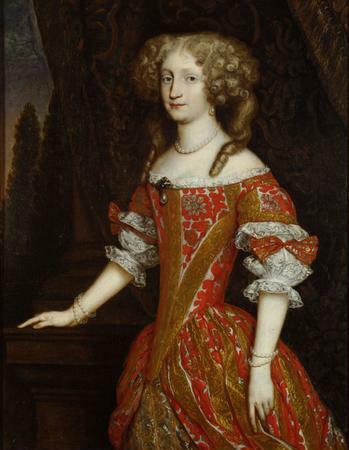 Mary, Princess Royal and Princess of Orange wears an ornate bejeweled brooch. 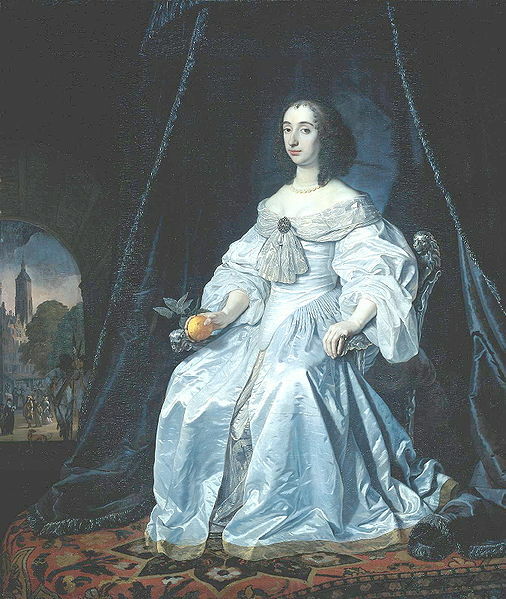 Painting by Bartholomeus van der Helst (1652). By the 15th century, the disc-shaped brooch became the universal standard, and it has remained that way ever since. 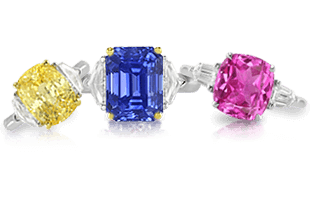 The size of brooches and use of gemstones has fluctuated somewhat over the last several centuries, and brooch design from these periods has few unifying trends. However, one might say that the brooches of the 16th century are characterized by elaborate enamel designs of figures and animals. In the 17th century on the other hand, precious metal brooches were enhanced with small gemstones. Princess Eleonore of Pfalz-Neuburg, the later Empress of Austria wears a large pearl brooch. C. 1675. During the 18th century, gemstones, especially pearls, were once again in vogue, and often appeared in brooches in elaborate geometric arrangements . By the end of the 18th century, cameo brooches became enormously popular and have remained so until the present day. During the 19th century, we saw the advent of mourning brooches to commemorate the dead, revivals of Egyptian themes and designs, and towards the end of the century, the new lacy styles of the Edwardian Period . The history of brooches in the cultural landscape reveals a great amount of style we will explore next in Brooches | A Guide to Elements of Style and Settings.